A North Carolina Earned Income Tax Credit is a common-sense way to help working families keep more of what they earn to cover basic necessities, and an evidenced-based policy to improve the health and educational outcomes of our state’s children. Forty of North Carolina’s 100 counties have a poverty rate above 20 percent. And according to the Working Poor Families Project, 12.1 percent of working families are living on earnings that keep them at or below poverty — meaning each year they earn less than $24,600 for a family of four. More than 36 percent of working families live on low incomes that fall short of what it takes to make ends meet on a conservative budget in North Carolina counties. 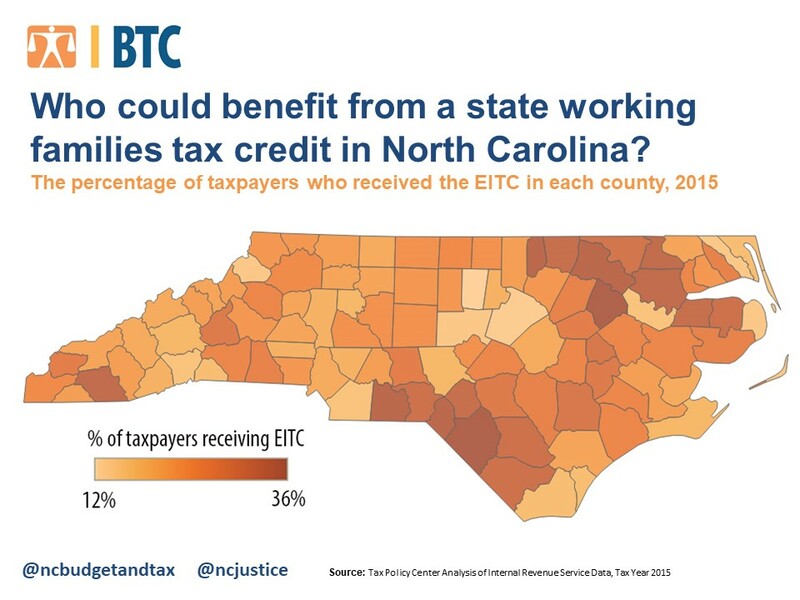 A North Carolina Earned Income Tax Credit would provide much needed income to households across the state — income that they have earned through work. It is a policy proven to strengthen the connection to work, especially for single mothers, and it generates significant benefits for children in households that receive the credit in the form of better school outcomes and higher likelihood of attending college. Nationally, the federal Earned Income Tax Credit lifted 5.7 million people, including 3 million children, out of poverty in 2017. 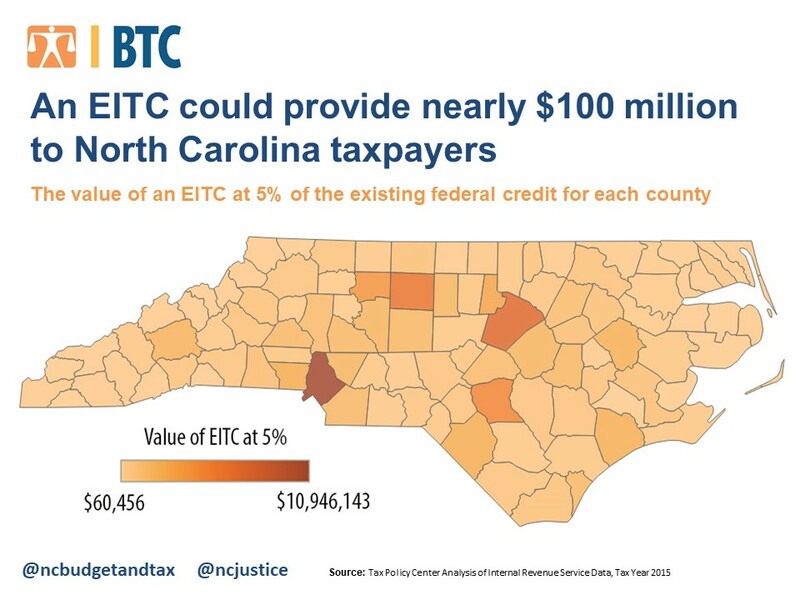 A state EITC at 5 percent of the existing federal credit would be easy to administer and would provide a value of nearly $100 million to North Carolina taxpayers in counties across the state. A state working families tax credit would mean people such as teachers, military services members, restaurant workers, and early childhood workers who are earning middle to low incomes would get to keep more of what they earn to pay for unexpected bills and the rising costs of basics like childcare, housing, and transportation to and from work. Such a credit would also mean those dollars would be pumped back into the local economies of North Carolina counties, as low- and middle-income workers spend more of what they earn and spend it locally. Robeson County, where 57.5 percent of residents are low-income, would see a return of $2,324,000 annually if the credit were set at 5 percent of the federal credit. Ashe County, where 41.5. percent of residents are low-income, could expect a return of more than $233,000 annually if the credit were set at 5 percent of the federal credit. Bertie County, where 52.5 percent of residents are low-income, would see an injection of more than $317,000. These dollars are vital to improving the health and educational outcomes of families in these communities, as well as creating and expanding jobs in local economies and statewide. It is time to invest in our communities and families with a North Carolina Working Families Tax Credit – it just makes good sense. Some adults don’t want to work because they get assistance from the government so they are not encourage to do better. Why should they be given to when both parents do not work. It is a sad state of affairs that a teacher with a Masters Degree with 30 years experience is considered low income. We have become martyrs again. Go ahead and throw us in teacher government housing and get it over with.